A recent episode of The Masonic Roundtable (it's Must-See-TV*) discussed Lodge history. Saying Lodge history — or Grand Lodge history, or even Masonic history — is a good thing is about as bold as being for Mom and apple pie but cataloging it and keeping it up to date is a difficult process. First of all, I have to mention my state, Missouri, has done a great job preserving its history with a large Masonic Museum and an extensive library. If you're ever in Columbia, both are worth the trip — but there is more. 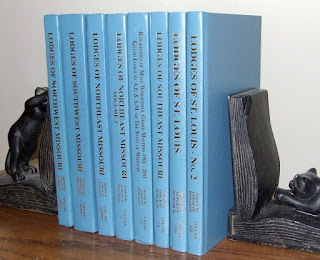 Beginning in 1999, the Missouri Lodge of Research, under the direction of its Editor Ronald E. Wood, Jr., published a complete history of existing Missouri Lodges. The monstrous eight-volume set included one volume of Grand Master biographies and took seven years to complete. As a reference library it's a masterpiece and, in my opinion, hasn't gotten the recognition it deserves. In order to get it written, Brother Wood asked each Lodge to submit its own history with a picture of the current building. He then compiled it into what may be the most comprehensive history of the local Lodges in any jurisdiction. The project had some rough spots. First, different authors made for differences in writing styles and inconsistencies in the individual histories. Some Lodges submitted extensive reports requiring as much as 20 pages. Others contributed only a paragraph. One such Lodge's only item of significance, for example, was that at one time it moved from 111½ Vermont Street to 111 Vermont Street... an earthshaking piece of Masonic history thankfully never to be lost. The second issue related to the fact that the Missouri Lodge of Research selected each of these eight volumes to be its "book of the year" — the premium distributed to each member. While cataloging this history was important, members became impatient with receiving similar books over the seven-year period. 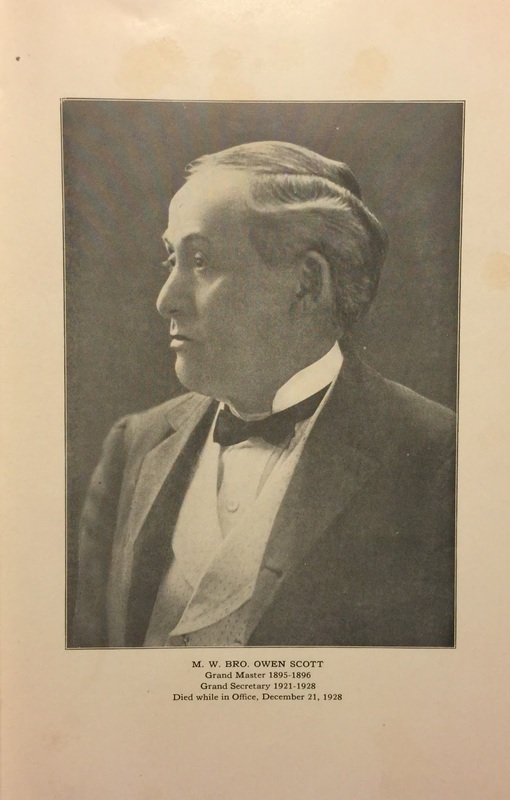 More than that, Ronald Miller, then Secretary of the Missouri Lodge of Research, reported there was a significant drop in membership from those outside the Grand Lodge of Missouri, who saw the books as not being relevant to their interests. 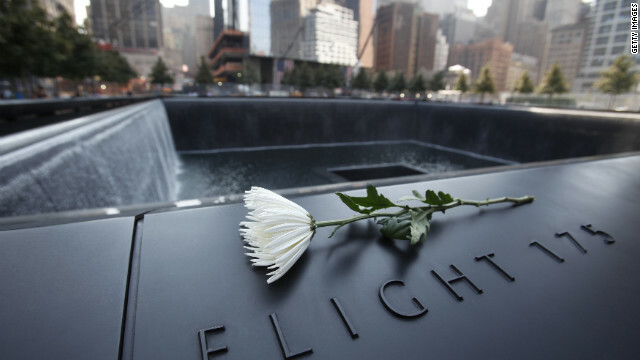 Still, even with its foibles, this is a unique and important history. As Editor of the Missouri Freemason magazine, I found the set invaluable. It would have been more valuable were it on the Internet in searchable, usable form. In fact, groups contemplating such projects should consider — as the Roundtable pointed out — publishing them on the Internet, followed by hard-copy publication, a step that may not even be necessary. This kind of project is an enormous undertaking but, for the purposes of Masonic research and history, well worth the work. *Well, technically, its a podcast most listen to, so it's Must-See-TV that most don't see and it isn't TV. Believe it or not, I don't carry petitions in my pocket. I don't walk around handing out petitions the same way banks walk around college campuses handing out credit card applications to students. I'm a quality over quantity guy. I'm looking for specific characteristics. I'm looking for men of good character. I'm looking for men with a desire and a capacity to learn. I'm looking for men who are trustworthy and personable. When I find that guy, that's when I might be inclined to bring up the subject of Freemasonry. I was told recently that makes me an elitist. I disagree. It makes me selective. Freemasonry has always been selective. Sometimes we forget that. We get all wrapped up in bringing in numbers, we forget there is a larger purpose. We're supposed to make good men better. Good men. The Fraternity has always looked for men of good report and well recommended. We're not looking for warm bodies, we're looking for men who want to grow--men who possess certain desirable traits. We want a man that will not only benefit from Freemasonry, but will be a benefit to Freemasonry. I have an old friend who is angry with me. I've known him for decades--since we were kids. He was angry that a couple of our mutual friends have joined the Fraternity at my suggestion, but that I've never invited him to join. I decided to spare him my full reasoning and focus on the one thing that makes that impossible--he's an atheist. He just laughed and said that was no problem at all--he said he had no problem saying he believed in the existence of God. And that's exactly why I could never recommend him. So don't look for warm bodies to fill your rosters--that benefits nobody. What you should be looking for are men who would make good Masons. When you start looking for those men, you might just be surprised at how many you'll find. Postcard of the Masonic temple in Chicago. At one time, tallest structure in the world. As a kid, my mom would drag me to antique stores, craft stores and fabric stores looking for whatever it was she was looking for. I hated it. I'd get hot, bored and eventually find myself hiding in clothing racks or just plain old sitting on the floor, leaned back on a wall with a bottle of coke and a comic book. As I got older, I started to not mind the antique stores as much. Sure, the cat and fabric stores still drove me to the brink of, well, whatever you can be driven to the brink of as a 12 year old. I mostly just sat in the car and read my comic books. But when we went to antique stores or malls, I found myself looking at interesting things, historical things and just plain cool things. The first thing I developed an interest for and something I started collecting was little wooden boxes, like small treasure chests. I had probably five or six of them at the height of my collection, which doesn't sound like a lot, but remember, they were antique, so they weren't cheap. One day, while browsing an antique store I ran across something I really hadn't before. A box of old comic books. I sifted through them and started cherry picking certain ones that met my criteria; good condition, interesting stories, poly bagged and most of all, cheap. I did still have to ask my mom if she would buy them for me. Over the years, I amassed quite the collection. My favorites were always by Gold Key, they published some neat Disney books as well as Star Trek. I was never a fan so much of superheroes, I stuck to science fiction and the like. As I grew older, I transitioned to Tales from the Crypt and other neat horror comics of the time. Looking back, it was fantastic. I still read comics to this day, not much has changed. After becoming a Freemason, antique stores held yet another thing for me to look out for. Every once in a while (once a month) I will stop by the local mall for a walk around. It usually takes me about an hour. You'll always find certain Masonic things e.g. pins, fezzes and pocket knives. But many of the items are actually new or just a couple years old. They get passed off as antiques because most people think we don't exist anymore and hence, it must be an antique. But every once in a while, I find a gem. Something that is truly remarkable. Again, things must meet the criteria; affordable, authentic and intriguing. 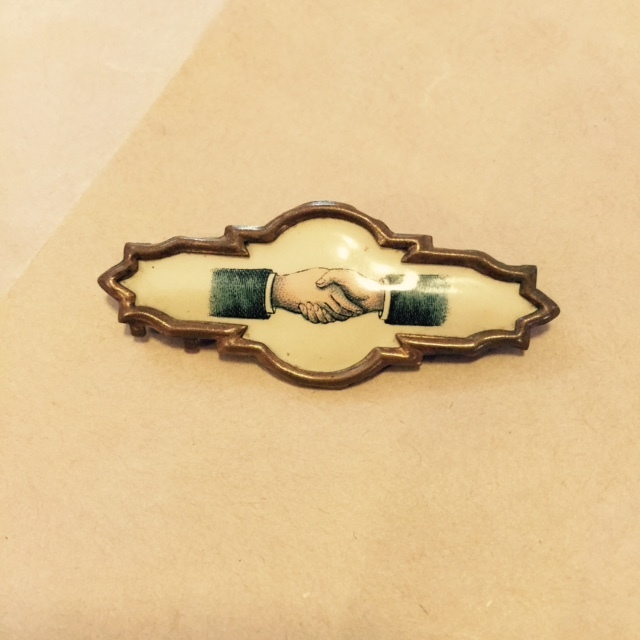 "Secret Society" pin which I recently bought. My most recent trip was just last week, where I found myself looking at a set of bronze Masonic bookends. The price was right, $45 for the set, but, I thought "Where am I going to put those?" And then I continued my browsing. 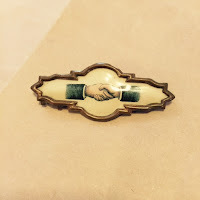 I was at the end of the antique walkabout when I spotted a peculiar pin. The tag said "Secret Society Pin" and was marked $10. Needless to say, I bought it. I can't call it exclusively Masonic because, well, who knows. But it is certainly applicable to the craft. Pictured here in this post are just a few of the finds which I have been lucky enough to have found. Bro. 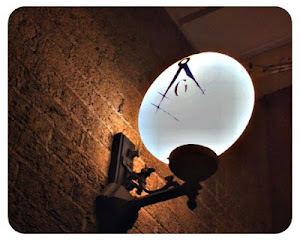 Robert Johnson, 32° is the Managing Editor of the Midnight Freemasons blog. He is a Freemason out of the First North-East District of Illinois. He is the Master of Waukegan Lodge No. 78 and Education officer for the 1st N.E. District of Illinois as well as a member on the Grand Lodge Education Committee. He is also a member of the York Rite bodies, AMD, The Illinois Lodge of Research and a member of the Scottish Rite Valley of Chicago as well as a charter member of the Society of King Solomon, a charity organization run by the Grand Lodge of Illinois. Brother Johnson currently produces and hosts weekly Podcasts (internet radio programs) Whence Came You? & Masonic Radio Theatre which focus on topics relating to Freemasonry. In addition, he produces video shorts focusing on driving interest in the Fraternity and writes original Masonic papers from time to time. He is also a co-host of The Masonic Roundtable, a Masonic talk show. He is a husband and father of three. He works full time in the safety industry and is also a photographer on the side as well as an avid home brewer. He is currently working on a book of Masonic essays. Bro. Aaron R. Gardner, 32°, MPS. A lot of my articles for both The Midnight Freemasons and Celestial Brotherhood focuses on the negativity that I find with our Fraternity, what we can change, what we can do to change things and how it all affects our Fraternity. I have also focussed on our personal relationships and other aspects of our daily lives. However, there are many things that are amazing about the Craft that I sometimes fail to mention. I don’t always talk about what the Fraternity has done for myself and the many reasons I love being a Freemason. Today, I would like to address some frequently asked question by those interested in joining the Fraternity and those who have no idea what Freemasonry is. Freemasonry is an individual journey, so the answers in the following questions will vary from person to person. It is important to be prepared to answer these questions in case a potential candidate answers them. The responses to these questions are my personal experiences, I encourage everyone reading this to begin thinking of their own responses. What brought you to Freemasonry? I was a Soldier in the United States Army when I decided to petition a lodge. While stationed overseas in Italy in a commonly shared recreation room I was watching the movie National Treasure. I found myself in a conversation about the differences between the truth and what was Hollywood fabrication in regards to Freemasonry. The man I was speaking with asked me what I truly knew and understood— I told him enough to know what is real and what is just a good story. As a history buff I already knew a lot of history surrounding the Freemasons, specifically, American History. He told me if I ever want to know more to contact him. It wasn’t until he shook my hand that I found his ring. Prior to this.I had had encounters with Freemasonry as well, but it was different. It wasn’t through my family, instead it was before I left for the Army. I had a going away party at the local lodge in Flushing, Michigan. My younger cousin and I were inquisitive from all the conspiracy stories we had heard about the Freemasons, their rituals and how they controlled the world. We were left alone to help set the hall up for my going away party, while alone our curiosity got the best of us. We found an unlocked door that led to the upstairs and we wandered around. The shadows danced across the lodge room with strange symbols and unlit candles, feeding our imaginations. A sudden noise startled us and we scurried down the stairway afraid to be left alone in the lodge hall again. Little did I know that wouldn’t be the last time I saw the that room in darkness. Later down the road, after my conversation with the Freemason in Italy, I started to research what Freemasonry really was. Again, I already knew a lot of the history, but what I really wanted to know about, was that dark room I saw as a young man. 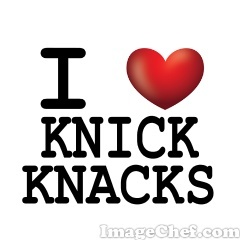 I wanted to know what was so special about this organization to have lasted so many years. I wanted to know the secrets. I petitioned the lodge in my hometown, which was so nice to allow my going away party in their hall— the lodge that did nothing more than shroud itself in even more mystery and lore with it’s shadows still dancing through my mind. I found some of the secrets, and I search for more constantly. At least, now, I have the right people to surround myself with and tools to answer all my questions when the time is right and I ask the right ones. I recently visited the 2015 Farm Progress Show in Decatur, Illinois. This is premier agricultural show in the United States. Though the official attendance isn’t released, estimates are that in excess of 200,000 person visit the show over the three days. Modern American agriculture is nothing short of spectacular. Science and technology are now imbedded in every facet of farming and agricultural production. Today’s farmers are using precision farming techniques to reduce the amount of inputs applied to their fields, thereby reducing the environmental impact and significantly improving production efficiencies. My family has a long heritage of farming and involvement with agriculture. My children are the eighth generation of our family to live in Champaign County, Illinois and we are still involved with agriculture. So what do agriculture and freemasonry have in common? Freemasonry, like agriculture, has played a vital role in the development of many of our small towns across America. The lodge was typically the place of social activities and many times was the largest building in the downtown area. Its membership roles were populated with many farmers of the community. I remember speaking with one of our older members of Ogden Lodge No. 754 (IL) one evening and he told the story that on the lodge meeting night, all the farmers would come in out of the field, park the tractor, change into their “good clothes” and to go lodge. There was something important that the farmers felt, even though they had much work to do, that they wanted to be in the lodge with their brethren. Despite all the technological changes in agriculture, like Freemasonry, its core values have not changed. Farmers use the tools of the trade to continue to till the soil, plant the seeds and harvest the crops that feed a nation and world. Freemasonry continues to nurture men who strive to grow and become better individuals, citizens, husbands, fathers and brothers. My Brothers, you became my brothers as soon as you took upon yourself the obligation of the Entered Apprentice degree. When you entered the door of your Lodge for the first time two questions were asked of you. The first was whether your entry into the Lodge was of your own free will and accord. The second was asked of the Junior Deacon, who was conducting you on your admission into the Lodge, was whether you were duly and truly prepared. These two questions are inter-related. Was your entry into our fraternity of your own free will and accord? Did any one entice you into becoming a Freemason? When the Investigating Committee spoke to you and your significant other were you asked the reasons for your desire to become a Freemason? Were you offered a copy of “On The Threshold” a pamphlet that explains the journey that you are now undertaking or some other material given by your Grand Lodge? As an extension of the query of your free will for entry into Freemasonry, you should have been informed that being a Freemason grants you entry into an elite fraternity of brothers. A Masonic Lodge is far more than being merely a social or charitable organization. The social and charitable activities of your lodge are important. You may be attracted to the social and charitable endeavors of the lodge. These are certainly laudable activities for every lodge to undertake. However, a Masonic lodge is also a place for moral and philosophical enlightenment. As experienced Masons, we envy the path that lies ahead for you in our brotherhood of Freemasonry. After taking your obligation in the Entered Apprentice Degree, you heard an explanatory lecture on the symbolism and meaning of the ritual that you had just completed. In the ritual for each of the three degrees in Blue Lodge Masonry there are some ninety items that require symbolic explanation. The explanations presented to you in the degrees are only a start in understanding what Freemasonry really means. Bro. Rollin C. Blackmer edited and produced a series of lectures about our fraternity. His book was entitled, “The Lodge and the Craft”. It was first published in the year 1923. In the first lecture Bro. Blacker remarked that in the year 1923 there were approximately 100,000 brethren in the State of Missouri. Of these 100,000 brethren only about 75 men had made a significant study of the symbolism, philosophy, and history of this Brotherhood to which they belonged. He went on to state that it was a lamentable state of affairs that the majority of its members were ignorant of most everything connected with Freemasonry. There are many reasons for this regrettable state of affairs. The first of these reasons lies in the fact that our fraternity is now approaching the 300th year of its existence. Much has transpired in the past 300 years. The fraternity cries out for its new brethren to take upon themselves a study of what the principles of our brotherhood really are and mean. You have joined a group of men who are the elite of society. You should consider yourself a Masonic brother to George Washington, Benjamin Franklin, Paul Revere, John Hancock, thirteen signers of our United States Constitution, and nine signers of the Declaration of Independence. You are a brother to a myriad of other Freemasons, such as Gene Autry, Ernest Borgnine, W. C. Fields, Clark Gable, Roy Rogers, Davy Crocket, George M. Cohan, Irving Berlin, Wolfgang Amadeus Mozart, General Douglas MacArthur and General Leonard Wood. I can go on and on listing the brethren who you can now call your brothers. You are fortunate, indeed, for having been welcomed into this great fraternity. Were you duly and truly prepared to enter the Lodge hall to take upon yourself the obligations of Freemasonry. This query can be considered on two levels. First of all, you were asked to divest yourself of all metals and wear a suit suitable to your degree. You were hoodwinked (blindfolded) and a rope (cable-tow) was placed about you. The meaning of these preparation and symbols were explained to you. In this context you were undoubtedly duly and truly prepared to enter to lodge hall. However, were you also duly and truly prepared in your mind and ready to start your journey in Freemasonry? In Freemasonry, it is true that your family and means of earning a living are predominant. And, I do not mean to imply that you are expected to become a Masonic scholar, while this would certainly be a laudable accomplishment. But, it is important that you understand what it really means to become a Mason. Are you duly and truly prepared to attend the meetings of your lodge, to the best of your ability? A Masonic Lodge is only as good as the brethren that are active in its affairs. Are you duly and truly prepared to learn what it means to be a Mason and live according to Masonic precepts? Freemasonry is an organization dedicated to making good men better. You are already thought to be a good man or you would not have passed the test of the ballot box and been admitted to your Lodge. A study of Freemasonry will give you the tools to become a better man. Properly implemented, your family and society, in general, will applaud your dedication to Masonic principles. So, my Brother, I welcome you into our fraternity. There are many in your Lodge who will aid your quest into the philosophy, symbolism, and history of our Order. You should find something that piques your interest in our Brotherhood. There are five basic areas of interest in studying Freemasonry. These are history, philosophy, symbolism, law, and ritual (its memorization and meaning). Find an area that is of interest to you and pursue it. There are dedicated brothers who will help you as you take upon yourself the journey to learn what it really means to be a Mason. My Brothers, I will close this presentation with a saying by the noted Masonic author, H. L. Haywood. His words may indicate to you the basic premise of Freemasonry, “Not More Men In Masonry, But More Masonry In Men”.